As the 2015 college football season turns the corner toward the home stretch, the Oregon Ducks are finally starting to hit on at least six or seven cylinders, but as far as a playoff berth goes – it is too little too late. Still, it’s turning out to be a reasonably decent season for a year in which the Ducks had to replace a ton of talent that has moved to the Sunday slot. All that’s left is to hope for the best for the final three regular season games, wait to see which bowl game the Ducks make it to, and maybe find a little humor in what has transpired this football season. Jokers, comedians and petty thieves are the subjects of this week’s Three and Out. 1. Jokers. The biggest jokers remain the playoff selection committee — and the underlying mentality that has allowed the present system to evolve. This is a group that is laughing all the way to the bank. Last year the playoff selection committee gave us a first round of finalists that included three SEC teams and Florida State. This year it’s two SEC teams, Clemson and Ohio State. The mentality seems to follow the pattern of the settling of America from 1492 on: Start out on the East Coast and then gradually work your way westward if and when you have to. That worked out fine for the settling of America, but it’s a little archaic for college football in 2015. The SEC is best because … well, just because. Despite a dismal performance in last season’s bowl games, the SEC still is in a position that playoff berths are the conference’s to lose. Ah, but those bowl losses were last year and this is this year? The entire SEC has wins over a total of two currently ranked teams so far this year: North Carolina (17) and Wisconsin (23). SEC teams have losses to Memphis, Oklahoma, Toledo, Western Kentucky and Texas Tech. But they have all those wins! Yes, over a list of teams more likely to make Who’s Not than Who’s Who: New Mexico State; Carolinas East and West; Louisianas Tech, Lafayette and Monroe; Eastern Kentucky, Southeast Missouri, Arkansas State, Connecticut, Central Florida, McNease State, Syracuse, Eastern Michigan; Tennessees Middle and Martin; Southern, Southern Mississippi, Ball State, Bowling Green, Nevada and five of the schools named after guys — Austin Peay, Louisville, San Jose, Troy and Jacksonville. And of course Texas A&M beat Arizona State before everybody else did. It’s true that the Pac-12 has done little to distinguish itself in nonconference games this year. But neither has the SEC … and here we are again. Hopefully the committee will follow last year’s precedent and end up with a reasonable selection by the end of the year, but in the meantime you’d have to think that there are better uses of resources than sending a group of people to a fancy hotel in Texas to come up with garbage once a week. Brett Bielema’s wife. Who can blame him? 2. Comedians. I’ve never been a big fan of Arkansas coach Brett Bielema, but he gave us a great laugh when asked how he planned to celebrate the Razorbacks’ upset of Ole Miss. Freudian slip aside, you can hardly blame him. 3. Petty Thieves. I’m not sure what the cutoff is between petty theft and grand larceny these days, but Arizona State’s stealing of other teams’ signals hasn’t yielded much more than pickpocketing at a homeless shelter. Before the season started, Sun Devils coach Todd Graham made no bones about declaring his 2015 team a contender for a playoff berth. Previously I wrote that Graham would be better served by keeping his mouth shut about making the playoffs, and maybe he will figure out that it’s best to just put his energy into walking the walk. 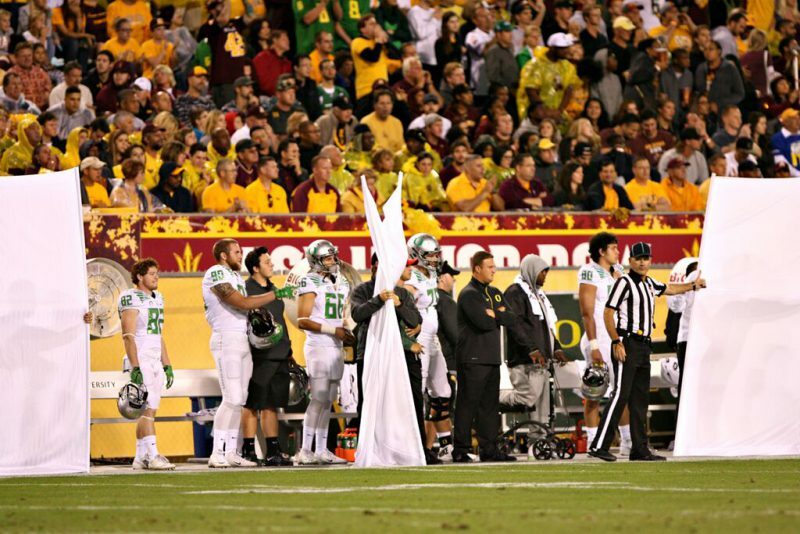 Ducks use white sheets to foil Graham’s pick pocketing of signals. But now you have to wonder if Graham is just getting in his own way. When there’s only so much energy and attention to go around it’s probably best to spend more resources figuring out what your own team is doing, and less about the other guy. The Sun Devils stand at 4-5 and their season has degraded from dreams of a national championship to a very likely possibility of not even being bowl eligible. To make it to a bowl game they need to win two of their final three against Washington, Arizona and California. If that’s what stealing signs gets you, it’s not worth it. This is not to say that the failed season is all on Graham. 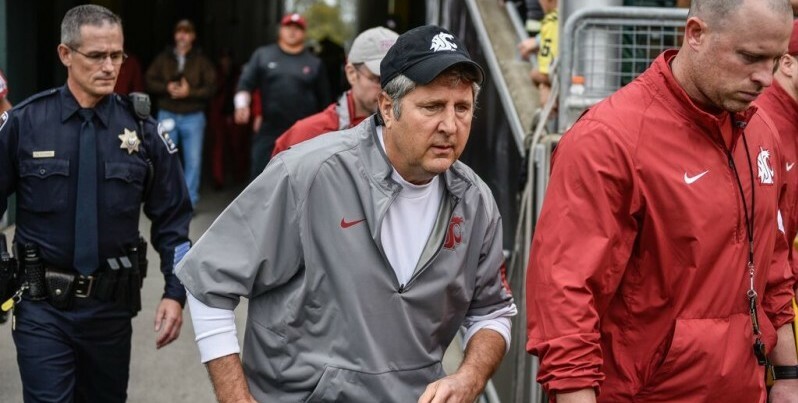 In the immortal words of the immoral Jameis Winston, the Sun Devils’ game against Oregon “coulda went either way.” And the Sun Devils definitely got shafted when at a critical point in the game this past weekend a Pac-12 official gave Washington State a fifth down. The ensuing play resulted in a Wazzu touchdown after ASU had made the stop on fourth and goal and was set to take over on downs. How bad was the call? It was so bad that the official making the call drew a suspension, and the entire crew got “downgraded” by the Pac-12. I’m not sure what that means, but being downgraded from the status of “Pac-12 official” is an interesting concept.